Imprimis I give and bequeath to my son Edward Thurston Ten shillings in mony he having had his part or portion all Ready. free and clear: all my Legacies to be paid by my Executor above named. Massachusetts, Wills and Probate Records, 1635-1991, indexed database with digital images, Ancestry.com (http://www.ancestry.com), Bristol County, Probate Records, Thurston, Gardner - Tillinghast, Joseph, images 848-854, Jonathan Thurston estate packet, image 854, Will, proved 1740. Jonathan Thurston does not mention a wife. Only one birth record for his 18 children names a wife - Susanna is named as the mother of Edward, born in 1679. She may have been born about 1660, and may have died between 1706 and 1712. Another woman (named Sarah?) may have been the mother of the last three or four children (including Susanna, Joseph and Job. 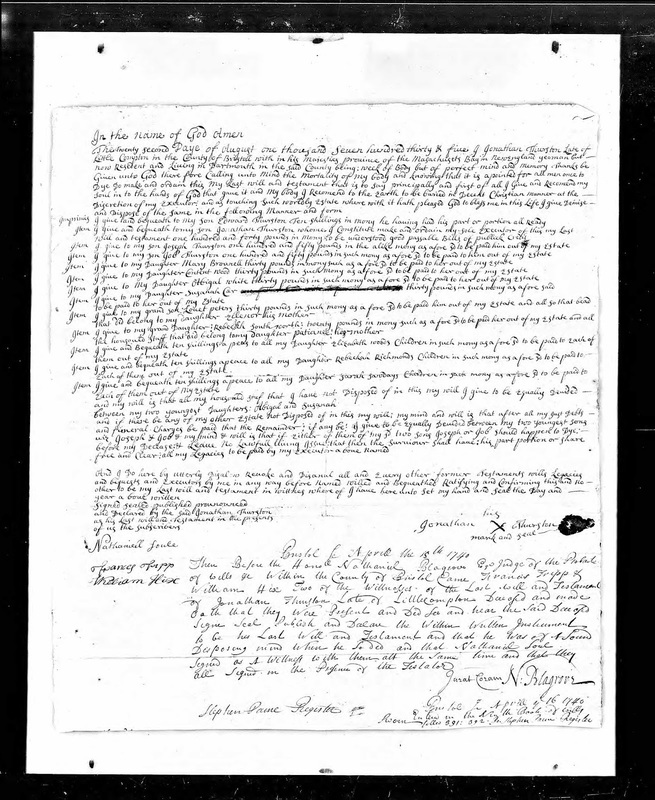 Jonathan Thurston is my 7th great-grandfather, and his daughter Abigail Thurston (1700-????) who married William White (1708-1780) is my ancestor.